Four Clover Life- By Namrata Singh: Mindful Eating- Oats and Vegetable cutlet. Mindful Eating- Oats and Vegetable cutlet. I experimented with the usual veg cutlet yesterday and added a little twist which turned out quite nice. I would like to share this vegetable cutlet recipe with all of you. Vegetable cutlet as we all know is basically a snack item made with mix boiled vegetables and of course a good dose of potatoes. Many add bread crumbs to it to get the crispy bite. It is normally a soft snack. I Tried a different version. It tastes differently that the usual veg cutlet but that's exactly the point -Recipes with a healthy twist which appeals to the palate. Here I have limited the use of potato and not boiled the vegetables so that we get the nice crunch from the chopped veggies and the goodness and crispiness of OATS- Having Oats is the highlight here because I am into fiber based foods. Mixing with oats made these balls/cutlets turn out nice and dry and one doesn't need to coat them in corn flour/maida (All-Purpose flour)/rava (Semolina) or besan (Gram Flour) batter to fry. These cutlets won't stick to your pan or lose shape or scatter around. It's the OATS wonder. Total time taken - 40 minutes. 1/3 cup fresh corn or frozen sweet corn. · Dry roast the oats a little till it turns light brown. I have here used rolled Oats -Classic style from Quakers and then grounded it in a blender to get the oats powder. Please be mindful that we don't add any water here. · Pour the oats powder. Add the boiled potatoes and finely chopped vegetables. · Add the crushed ginger and green chili paste, cumin powder, garam masala powder, coriander leaves and salt as required. · Mix everything very well. Check the taste and if desired by you add more salt or the spice powders. Shape them into balls or flat like patties. · Heat 2 to 3 tbsp oil for shallow frying in a pan. Take a veg ball and putt it to fry. You can put together three or four balls. You can give them any shape you desire. I preferred it round today but you can make it like tikis or use a cutlet mould to give an interesting shape. · Try to keep rolling these cutlets so that all side turn a nice golden color and crispy. · Drain veg cutlets on paper napkins. 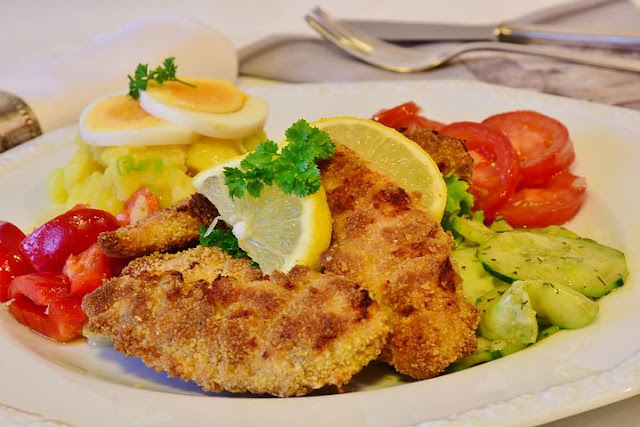 · Serve vegetable cutlets with the sauce of your choice. Due to the paucity of time, I went ahead with tomato ketchup. · You can add vegetable of your choice-beetroot, green peas, bell pepper but remember that keeping them finely chopped helps them roll better into a cutlet/ball. · In case you find that the balls are too dry and not forming the shape, add half of another boiled potato or few drops of water. · You can play around with spices as per your taste preferences. You can also use black pepper powder or white pepper or red chili powder. · Prefer not to use the market sold ginger paste. It has a very strong flavor which smells much differently from the freshly ground ginger or garlic and has a smell which refuses to go. I absolutely say no to the market ginger garlic paste.